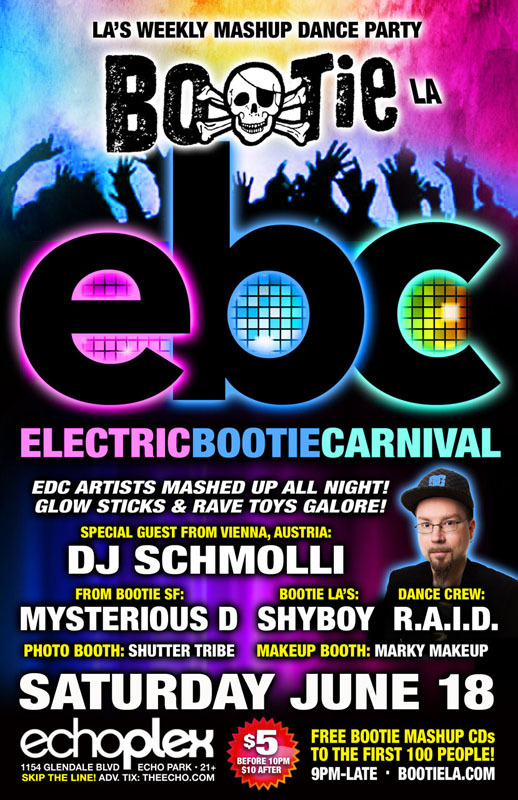 Bootie SF gives you the next best thing to being at EDC in Las Vegas -- it’s the Electric Bootie Carnival, with special guest DJ Schmolli from Austria, one of the best mashup producers and DJs in the world! Expect EDM-flavored mashups all night long, LED sticks, glow necklaces, and rave toys galore to keep your candy-colored PLUR smiles going and getting you into the spirit of “EBC.” Only $5 before 10 PM! Bootie mashes up rave culture for the Electric Bootie Carnival, with special guest DJ Schmolli, direct from Austria. A producer of mashups for the last 16 years, he’s created over 350 of them — many which are staples not only at Bootie, but also on BBC Radio 1 and Austria’s biggest station OE3. Joining him will be resident DJs Mysterious D and ShyBoy, plus resident dance crew R.A.I.D. (Random Acts of Irreverent Dance) will be taking over the stage for ravetastic go-go insanity all night long, Marky Makeup gives your bodies festy makeovers, and Shutter Tribe captures it all! Plus FREE Bootie mashup CDs to the first 100 people through the door!